Apparently, as we have been able to read through the social network Weibo , a popular user, in addition to supposedly having written from a Xiaomi Mi Mix 4 , this has uploaded a new pixelated image of what could be the next generation of the Mix range. Specifically, this user called Finder is already known in the social network for publishing various articles of this type, some being certain but others of doubtful credibility. 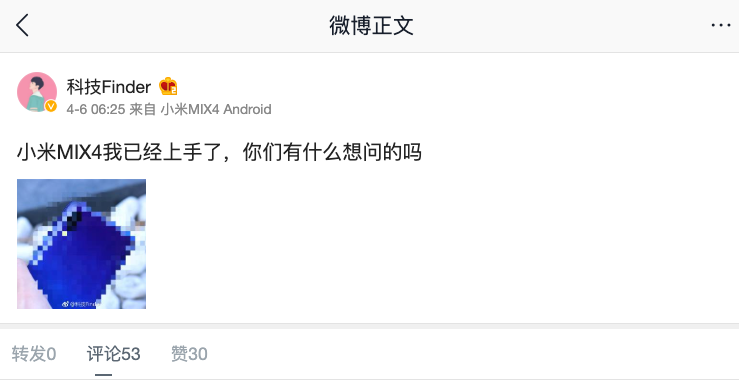 In this case, in addition to showing a pixelated photo of the supposed My Mix 4 , this has left open that thread in Weibo so that other users can ask any curiosity of the new device . The question that is repeated is the number of cameras present in this course Xiaomi Mi Mix 4 , to which "Finder" has responded that only has 4, two front and two rear . Even so, many users who have responded agree that it is really a Redmi Note 7 and that this user just wants to have a good time making us believe that he really has some unbelievable form of this new terminal . Publication made on Weibo supposedly from a Xiaomi Mi Mix 4. If we look closely at the publication made on Weibo, we can see how the mobile application of this social network shows the device from which each new thread has been written , indicating in this case that it really is the Xiaomi Mi Mix 4 . Even taking into account this detail, it should be noted that currently it is very easy to "falsify" this data , making it look like any browser, application, etc. that we are writing from a totally different terminal to the one that is really. If you want to be aware of any news, rumor or leak of the next generation Mi Mix, do not forget to join our group regarding the Xiaomi Mi Mix 4 on Telegram: @ MiMix4Xiaomi . And you, what do you expect from the next generation of the Xiaomi Mix range?